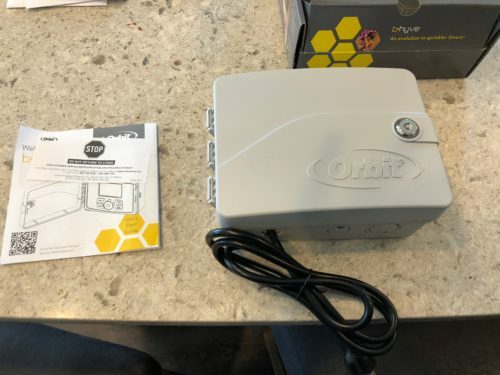 Orbit B-Hyve is a twelve station smart sprinkler timer. 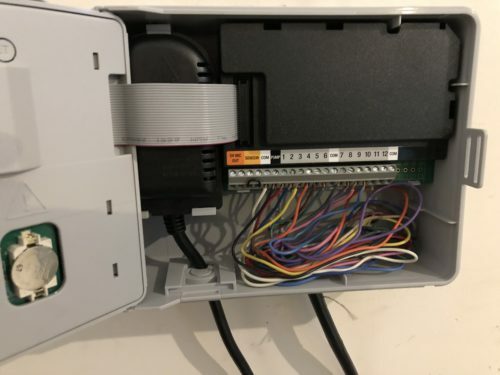 It connects to a irrigation system with up to twelve zones. Orbit also offers a six zone model for $109.99. Features include smart watering, smart scheduling, iOS and Android app and Amazon Alexa integration. Packaging for the B-Hyve is excellent. The box comes with the timer, instructions, keys and mounting screws. The instruction manual is very thin, so their website is very helpful. 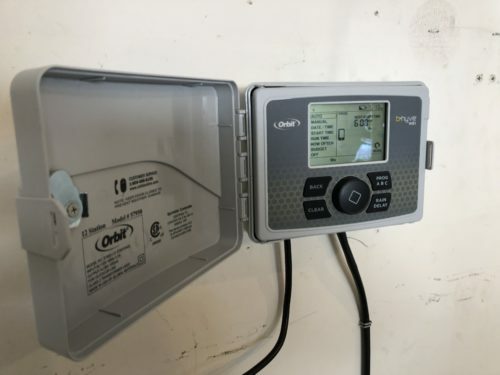 Let me start out by saying that I have no idea how to install a irrigation timer. If it involves electrical current, I will call an electrician. I also have a maintenance contract with an irrigation company who installs and takes care of my system. Spring is finally here so they came out to turn it on. 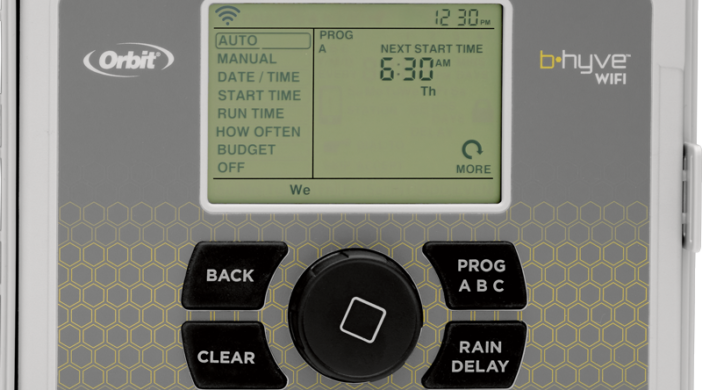 I asked the technician whether a smart timer was a good idea and he said it was. He told me that he wasn’t allowed to install it because they didn’t sell it, but explained to me how to do it. It sounded almost too easy. After he left, I got to work. The first thing I had to do was to note and take pictures of the current wiring. Each wire is colored and corresponds to a different zone. The white wire is common and the black wire is for the pump. Next step was to remove the old unit. I disconnected the wires and removed the mounting screws. Once the old unit was off the wall, I punched out a predefined hole in the bottom of the unit to run the wires, removed the tab for the battery and mounted the unit. After that was done, I attached each wire to the proper location, tidied up the wire bundle and plugged it in. Next I installed the app on my iPhone and followed along. It went perfectly. I mean, I expected something not to work, anything — a wire in the wrong spot, a sprinkler not coming on, something — but it was flawless. I was shocked, and fairly proud of myself. The app walks you through many settings. You can name your zones, add a picture to them if you want, test the zones, create groups and more. From there, you either can set up timed schedules or smart watering. The app gives you full control over the system. You do need to create an account before you can do anything with the app. After setup, the app is easy to use. You can run tests, create schedules, change settings and check status. It uses your location to determine the weather and creates smart watering. Smart watering takes factors such as location, weather, type of soil, types of garden and other factors. You can override at any time or not use smart watering if you don’t want to. I did enable the Alexa skill and linked it to my account, but I was not able to get it to work. It acts like its going to turn the sprinklers but they do not go on. It’s probably something I’m missing, but it’s not that important. I will report back after the summer to see how my lawn turned out, but so far it’s working great. MyMac Review Rating is 9 out of 10. Installation was much easier then expected. App setup was a bit involved, but easy to follow along.